Add an air of elegance to your look with this stunning 9ct yellow gold earring and pendant set. 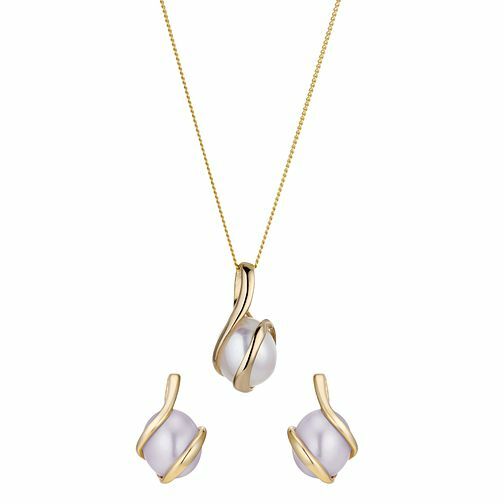 Featuring pearl stud earrings and a pearl pendant all lovingly wrapped in a 9ct yellow gold swirl design. This set is perfect for matching sophistication. All lengths stated are minimums. 9ct Yellow Gold Freshwater Pearl Earring And Pendant Set is rated 4.7 out of 5 by 3. Rated 4 out of 5 by Anonymous from Great Product Really nice set of pearl earring and necklace. The only con is the necklace is quite tight and the chain is very thin but looks really good. It made an excellent Christmas present.